With the results of this week’s elections, 34 states have adopted eminent domain reform in the wake of the U.S. Supreme Court’s wildly unpopular decision in Kelo v. City of New London. "Does the Constitution prevent governments from taking property through eminent domain simply because the property owners refused to pay off a private developer?" In Kelo v. City of New London, this Court held that economic development within an integrated development plan was a “public use” under the meaning of the Fifth Amendment to the U.S. Constitution. Does Kelo therefore completely preclude all claims of private purpose takings within an integrated development plan area, including a claim that eminent domain was used for financial extortion and the purely private financial goals of a single party? What limits if any do the Fifth and Fourteenth Amendments to the U.S. Constitution place on demands for cash in exchange for refraining from the use of eminent domain? 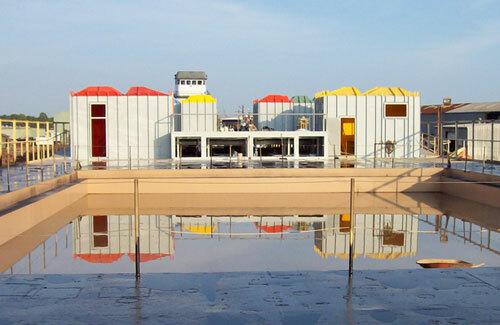 October 17, 2006, pool construction has been completed and the "floating pool" embarks upon a 10 day voyage from Louisiana to its new home in NYC. October 27, 2006, the barge is scheduled to arrive in New York Harbor for a "welcome party."